In 1890, the Trustees of Evergreen offered local lodges of the Knights of Pythias, the International Order of Odd Fellows, Masons, and the Grand Army of the Republic plots for the payment of a single dollar instead of the normal $55 price for a single plot. As a result, lodge insignia abound at Evergreen. 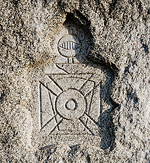 The compass and square of the Freemasons or Masons, hark back to the stonemasons of England and Scotland and the benevolent society they formed in 1717 in London. The Improved Order of Red Men originated in 1765 and traces itself back to the Sons of Liberty. Patriots who concealed their identities, they worked for freedom in the early colonies. They patterned themselves after the Iroquois Confederacy and its governing body. After the War of 1812, the group changed its name first to the Society of Red Men and in 1834 to the Improved Order of red Men. 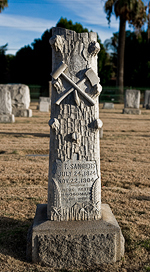 The crossed tomahawk and axe with the initials of the order are seen of Evergreen grave markers. Even though there is no record of an early Odd Fellows lodge in Riverside, many graves at Evergreen display the three linked rings of the Odd Fellows organization. Often the single links of the chain contain the initials “f”, “l”, and “T” standing for Friendship, Love, and Truth. An international fraternity that promotes universal peace, the Knights of Pythias was founded in 1864 in Washington D.C. during the Civil War. 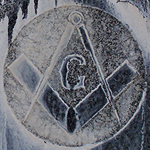 The “F”, “C” and “B” of the insignia stand for Friendship, Benevolence, and Charity. Often using a heraldic shield with components of a suit of armor, the Knights of Pythias were fond of symbols and used many thousands in the emblems. Woodmen of the World was founded in 1890. One of the benefits of membership was the provision of an unusual grave marker to members, a headstone in the shape of a tree stump. This benefit was discontinued in the 1920s for reasons of expense and later graves are marked with a drawing of a stump, axe and maul. The Grand Army of the Republic (G.A.R.) is prominent in the historic section of the cemetery, occupying an island in the pathway in the section of the cemetery between 13th and 14th streets near Redwood Drive. 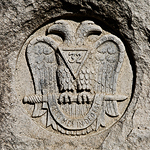 Organized after the Civil War, the Grand Army of the Republic was an organization of Union veterans. 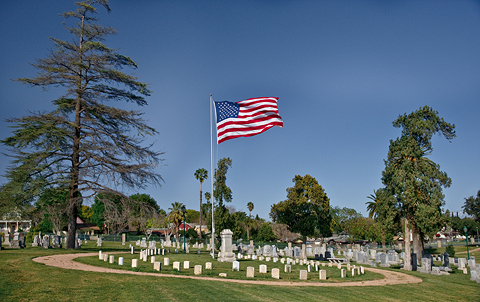 Veterans of the Spanish American War succeeded the Grand Army of the Republic burials in this section of the cemetery as Union veterans became fewer.